Slowly add oil, whisking until blended. Add avocado slices, gently turning to coat all sides (to prevent avocado from turning brown). 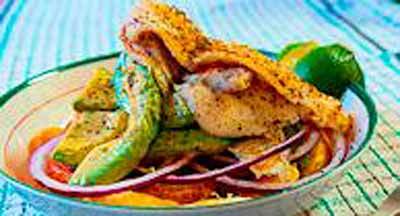 Arrange orange slices on a deep plate; top with avocado slices and onion slices; drizzle with lime juice mixture. Set aside. Sprinkle blackened seasoning evenly on both sides of fish. Cook fish in a non-stick skillet coated with cooking spray over medium-high heat 3 minutes on each or until fish flakes slightly with a fork.